the scent of green bananas: considering the persimmon. Posted by santos. This entry was posted on 20051116 at 12:41 AM You can skip to the end and leave a response. I've never made anything out of persimmons; I just peel them and greedily chomp down. They seem to disappear in seconds. I don't generally like to do anything with fruit...cos I'm lazy. And. I LOVE PERSIMMONS! 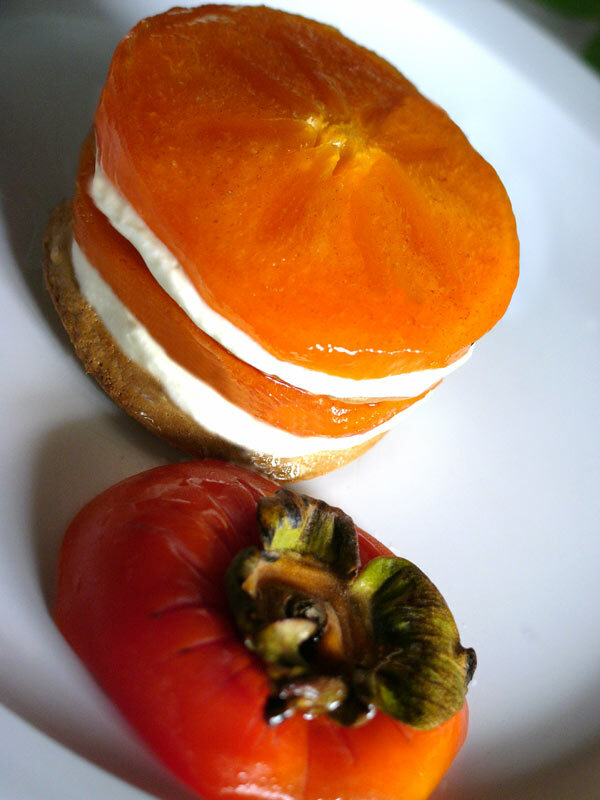 The persimmon + meringue sure looks good though. Ooh. i've bought dried persimmons in Sacramento, dried in traditional japanese fashion. There's a good article from the Sacramento Bee on it. I'll email it to you when I dig it up. What a fantastic post Santos! So what do you look for when you're picking these out? Is it OK if they look past their prime? 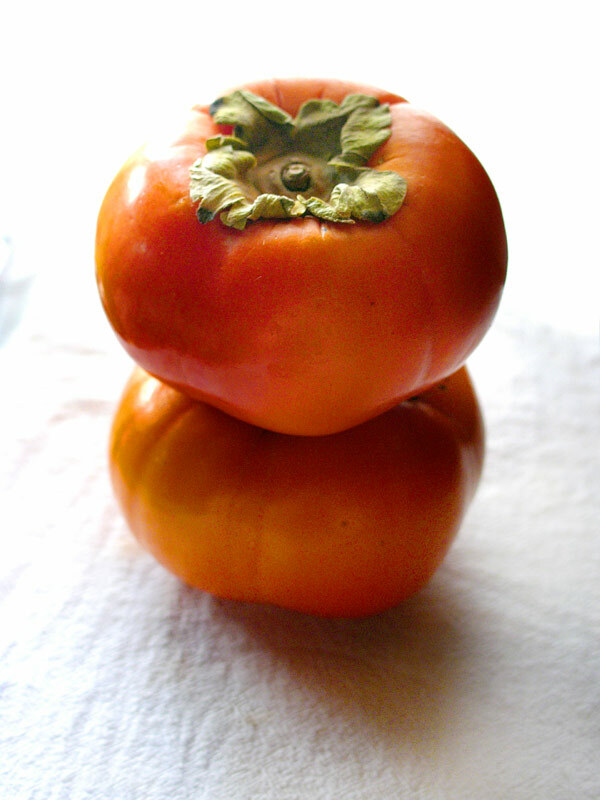 I was attracted to that particular recipe in Shunju as I had wanted to have some persimmons recently. I still have the recipe you gave me last year and it's in the kitchen....so I think I'll be making it this week. BTW...did I ask last time if these were from your parent's house? hi robyn! thanks for your help--i think you ARE learning something, heh. and i think you'd like the persimmon meringue thing a lot. hi mila--thanks! i'm looking forward to reading it. hi bramble--i know what you mean. i wasn't very fond of them as a child, but i like this savoury approach more than using the fruit in sweets. having said that, this brown sugar meringue thing rocked the house down. hi cathy! most of the persimmons i come across are still a little hard, but if they are soft and a little bruised, i'm assuming they are super-sweet and probably decent for eating as is. i'll bet they'd be good for something like a steamed pudding or baked dessert (this is a recipe i made last year). i wouldn't pick up anything with black or brown blemishes though. hi reid! persimmons don't grow here :( i don't think it gets cold enough. these are air-flown in from korea, i think, but we get them from japan and san diego, too. the last big batch i had was from my uncle's backyard in tulare (get well soon, unc!). you say "tomato", i say "get your eyes checked"--anthony, most tomatoes are red. bwah. no, i know exactly what you mean, although it hasn't been a problem for me so far. 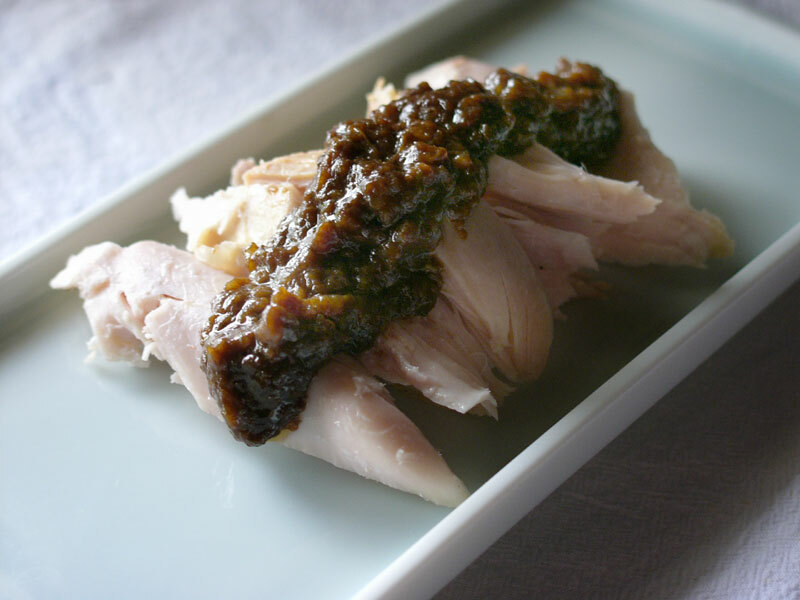 although, i rather like the idea of making some sort of pasta dish with a persimmon sauce, insteada tomata sauce. and i admire that you go with the flow. that last picture is pure perfection! I'm partially red-green colour blind. Ishihara tests just do me and I sometimes wonder what my photos actually look like after I've been messing around in photshop. The persimmons do look kinda red. hi maria! that meringue thing was purdy darn special. anthony--doesn't seem to have harmed your photos at all. i wonder what they'd look like if you weren't a bit colourblind. I wonder, it's a funny and maddening thing to think about being trapped in our own little worldviews that we can't just step out of. are you talking about being colourblind or being blind to something else? I cannot think of persimmons without thinking of that wonderful poem by Li-Young Lee. Thanks for visiting my site. I've been by here now a couple of times and I am charmed by your affection and sensibilities toward food. I've just recently discovered persimmons and I am kicking myself for not looking through Eric Gower's book, which is sitting on my bookshelf! Wow, you also have the Breakaway Japanese Kitchen AND Shunju?? I bought both those books at the same time last year. Awesome books, huh? I love persimmons even the blobular gooey ones. Actually in Korea Persimmon sorbet and ice cream is popular. One way if you are forced to eat the bobular one is to peel it and 1/2 freeze it. It has a texture kind of like sorbet but alittle more icier. Pretty good treat! hello houston, thank you for your kind words. you know, you've summed up my attitude towards food perfectly--not quite love, but very much an affection towards it. thank you for that, as well. that poem is lovely! i found quite a few haiku with persimmon as the subject, it seems to inspire quite a few people. hi amparo--yes, they're great! i'm having a difficult time tearing myself away from them. i could easily go through both books (if i could find all the ingredients that is). hi milgwimper--we don't see the blobular ones around here much, but i'd definitely like to try that! perhaps next time i'm on the mainland, that sounds like a treat. Hi folks -- I'm actually making persimmon ice cream right now (in May?? they're from Chile), so I was googling around and found this site. 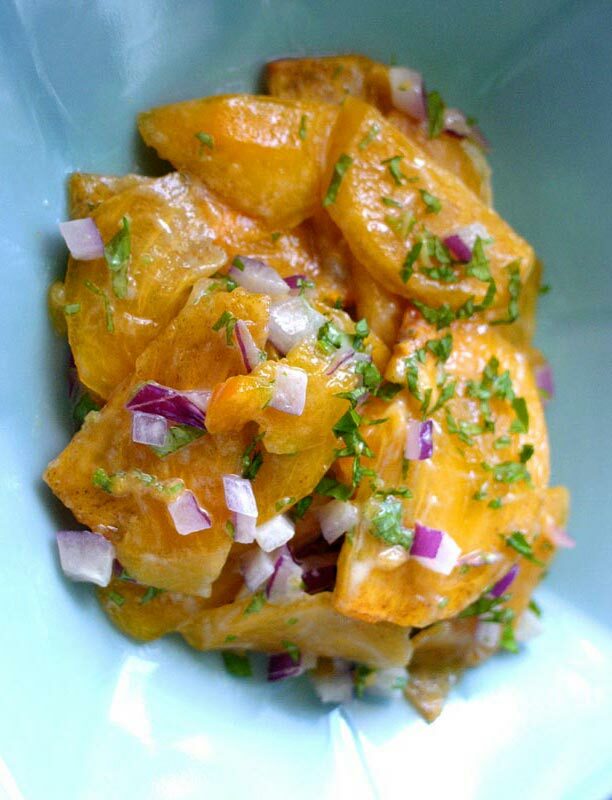 I want to thank Santos for making my humble persimmon dishes. Yours look much better than mine!